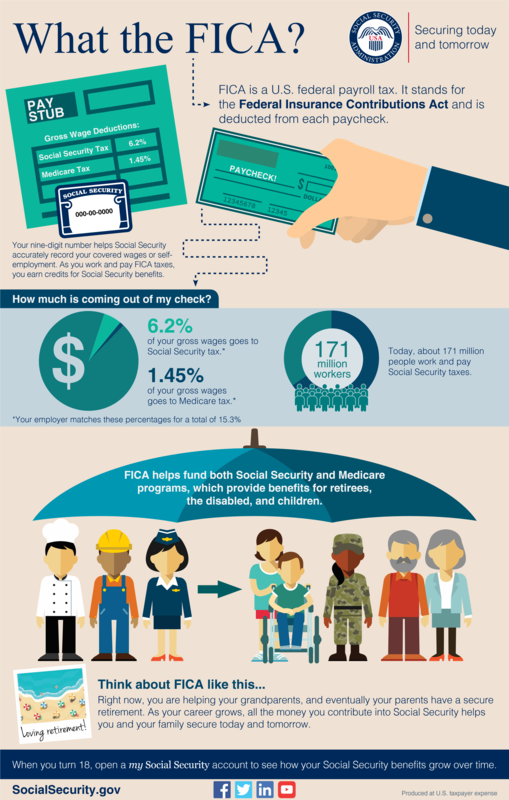 FICA taxes help provide benefits for retirees, disabled people and children. This contribution helps your parents and grandparents have a secure retirement while securing today and tomorrow for you and your future family. Learn more about FICA. This entry was posted in Taxes and tagged Disability, disability benefits, Federal Insurance Contributions Act, FICA, FICA taxes, infographic, medicare, payroll tax, retirement benefits, Social Security benefits, social security check, Social Security taxes, taxes by Jim Borland, Acting Deputy Commissioner for Communications. Bookmark the permalink. How do i go about finding money owed me by government? My question/comment is how to explain the need for all to contribute to this tax above all others especially when everyone eventually gets a benefit at later end of working life. I just don’t understand whinny one sees the importance of this and why the government feels the need to put the funds elsewhere, totally eliminating the purpose of the tax. @Maria Rose: Because humans live together in groups, and we ALL contribute a bit to the common pot for the good of ALL of us. That’s what humans – and in fact, all non-human animals as well – do, as a matter of survival, instinct, and psychological necessity. Until very recent times, it has always been the collective good; this fiction that’s been promoted in the past couple of decades by the far right of “everyone taking care of him or herself” is a myth. Do you have a toilet stool in your bathroom, for instance? And use it? Well, the sewer system carries away the waste to the treatment plant without need for you to go find somewhere to get rid of it yourself. And that sewer system is for everyone. Who pays for it? We all do, with our tax dollars. Without this, we’d have sewage running down the center of dirt roads, exactly as it was in days past before treatment plants and city utilities were designed and implemented. There are still many countries today where people are still squatting in fields and on the side of the road; acvordingly, they have extremely high rates of cholera and other diseases we don’t even think about. Without the government to provide water, sewer, utilities, police, fire, etc, we’d be in chaos. Now, that was one tiny example; of course as societies became more complex, around 6000 years ago, they added more and more ways to provide for the common good. Even in Bible days, they had the collective granary so that during times of drought or famine, everyone could be fed, receiving a share from the common store, because the government was taking care of all the peoples’ basic needs. The Roman Empire in the time of Christ even had a welfare program by which they provided food and housing for the poor; even they took care of their sick and disabled. Obviously, society is even more complex now. Because literally everything is driven by money, we all need it to provide even our own most basic needs just to live. Prior to Social Security, when peoole grew old and could no longer work for an income, many of them became destitute and homeless and had no options to care for themselves. For that reason, over 60 years ago Congress decided that our elderly should not be living in the streets when they couldn’t work any more. As a solution, they created Social Security as a means by which to ensure that everyone has a chance to live out their final years in safety and dignity. This orogram has gone on to become the most successful program in our country’s history, paying for itself (it is 100% self-funded, no money comes to Social Security from the General Fund nor has it contributed one penny to the national debt) and operating so efficiently it only spends 1% of what it takes in for administration of the program – and that’s saying a lot. For more background information, you might try reading a little American history, particularly of the government’s ongoing efforts to address the needs of the people by setting up programs like Medicare and Medicaid so that the elderly, disabled, and financially disadvantaged for whatever reason could get medical care when they needed it. Medicare, another extremely efficient and successfully operated program, was created in the 1960s when the government recognized that these groups, particularly the elderly and disabled, could not (and still cannot, nor will they ever be able to) afford to buy health insurance on the so-called “open market” and thus were unable to get any medical treatment when they were ill.
Let me be perfectly clear: the sole purpose of government, any government, is and always has been to take care of the basic needs of day-to-day living for ALL the people; whereas any for-profit private business has as their sole and primary mandate, their entire reason for existence, in fact, to generate as large a profit for the shareholders and other investors as possible. I am sure you can see that a focus on generating maximum profits is completely the opposite of ensuring that everyone has at least a minimum quality of life and an equal chance at survival as the only goal. Taxes, FICA, etc, are part of a fund that everyone contributes to so that all may survive in our later years or should we become unable to provide for ourselves. Some may call that “socialism;” however, that would make every species of the animal kingdom “socialists,” too. Since the beginning of time, both humans and all other species of non-human animals have formed groups in order to survive; for hunting (so all can be assured of enough to eat), protection (safety in numbers), to raise their young, etc. And by the way, non-human animal groups of every species work collectively to protect their most vulnerable members: the young, the old, and the sick/injured. While you’re reading American history (focus on the years after the Great Depression up to now, especially the 40s and the 60s) you may want to check out a little bit of human anthropology, and even a little bit about wild animals, including flocks of birds, schools of fish, herds of reindeer or zebras, elephants, wolves, etc. And in case you don’t like to read, you can always watch the Discovery Channel, The History Channel, and Animal Planet. Even if you can’t afford or don’t have TV service you can watch episodes of all these and more on Netflix or even YouTube for free on the Internet. There is no excuse for anyone in this day and age to continue to hold onto the false and misleading notion of “every man for himself” when we have literally all of human knowledge available to us at the click of a mouse. I hope this helped to explain at least a little of what it means to be a human and a member of a society. Age 70+ worked 50+ years full-time. Now retired collecting SS and starting part-time work with a temp agency. I assume that I will be paying FICA but it will not increase my SS because it will be a lower average income than my full-time work. Any comment? It is insurance and you are part of an insurance system with millions of others. Let’s put this another way: if you receive a claim paid to you for medical treatment by your insurance company, do they suspend premiums for you for the rest of your eligibility to the plan? Under social security, you have no private account, can be paid well beyond what you contributed personally and are contributing to a shared pool (the definition of insurance) so therefore you are collecting someone else’s contributions right now and are making contributions to others who come after you. This is not a personal pension or an annuity plan but social insurance insuring against the loss of income from work. Could you please send me a information Thank you. You are under a misconception. Part of the formula used to pay retirement benefits removes 5 of the lowest earning years from the calculation. There is a good chance what you now earn part time would be higher than what you made full time 30 years ago. Therefore the tax on your current earnings could increase the amount of your monthly benefit check. All your years of earnings are adjusted for inflation, so part time wages now may not add to the monthly check. SS uses the highest 35 years of earnings. FICA is the Federal INSURANCE CONTRIBUTION Act under which CONTRIBUTIONS are TAXED to employees & employers that are not INVESTED to ensure retirees, disabled and children receive BENEFITS. Whereas pension plans are designed to be funded with less than 10% of wages to provide life time income after retirement, a 15%+ funding of social security may not be sufficient to provide less than the private pension plan. Can anyone employed by the administration explain any part of this? Perhaps I do not understand, but I do not think the title wording on the flyer is appropriate. It seems to either be poor grammar or perhaps a reference to foul language. In either case I do not think it is an acceptable opening statement for a flyer produced by a governmental agency with taxpayer dollars. Mark I agree with you. This world we live in just keeps getting more and more base with little regard to any propriety. It is very inappropriate. Mr. Borland, as acting deputy commissioner of Communications, I think you owe your viewing public an apology. Excuse me? In what possible way could the title, “WHAT is FICA” be considered “base,” “inappropriate,” or in any other way objectionable? You people clearly have it too good if that’s the worst thing you’ve seen on the Internet. Sheesh! Same applies to you sir. Please tell me would you rather have something like that that tells it like it is or would you rather have something smoothed over with sugar and cream? I would much rather have a flyer that tells it like it is than something beating about the bush trying to sugar coat something. Will paying FICA give me work quarters to use towards my Medicare Part A benefits later in life? I am a government employee who does not pay into Social Security otherwise. Thank you. OH YEA, and I am speaking from actual experience. I am 72 years old have have been on SS since I retired at 65, 7 years ago. Without FICA I would have nothing for my retirement other than my savings and with the costs of things today that savings would have been gone long ago. I have land for patents I am gathering on behalf of my family to secure from scam artists. Is there a short cut to procuring them or do I have to go state to state? To start with,as a hard worker then i do expect after 66 so i will died as this kind of people who died after 66 without hope.Besides,how you can help,thanks.GOD BLESS AMERICA. To start with,then you know the system and how you can help me the right way in the system.Thanks. About the policy way in the system,please how you can help.Thanks. What percentage goes toward MEDICADE? Florida residents can be shielded from loosing their home if they are on MEDICADE and have the right to transfer it as an inheritance at their death. I know they can’t take anything with them! Indiana residents does not have the same opportunity, their home must be placed in a ill revocable trust to shield it. Otherwise the State takes title to recover unreimbursed expenses and that sounds fair because all taxpayers pay for the care of someone who doesn’t have the funds to pay. I know each state constitution is different and the USA constitution is basically to provide for defense of the USA against other hostile countries. Should the percentage collected from that person and any funds after the sale of their home and personal assets be provided as directed in their will or go to the state if intestate? No, you’re incorrect. The entire Constitution is about providing for the common good of all americans; in fact, the Constitution itself forbids a formal standing Army, as it forbids fighting any war on foreign soil. The military as it is now was a creation of Congress. The Constitution is actually a very short document, you can read it in 15 minutes and it’s available as an app for both iPhone and Android. Check it out sometime. More States need to review their laws to protect those who they represent! Hi, I have and still pay FICA taxes on my paychecks. I am getting SS benefits under my ex since I am 66. What I don’t understand is while I am still working I am still taxed 85% of my SS benefits. So I am paying taxes on taxes that was withheld from my paychecks for 40 years. It doesn’t seams fair because I choose to work. Thank you for your comment Jocelyne. Everyone working in covered employment or self-employment regardless of age or eligibility for benefits must pay Social Security taxes. Also, some people have to pay federal income taxes on their Social Security benefits. This usually happens only if you have other substantial income (such as wages, self-employment, interest, dividends and other taxable income that must be reported on your tax return) in addition to your benefits. For further income tax questions, you will need to contact the IRS. Dear fellow Americans — FICA is not a dirty word! It’s an amazing benefit that accrues as soon as a worker receives formal pay, either as wages or salary. I was amazed at the deducitons from my first check when a high school senior clerking PT at Woolworth. My dad explained the purpose of all the deductions and I understood the point of common good, as my family understood it from the New Deal. Decades later my spouse and I both benefit from a lifetime of hard work and the security that if anything happened to us before retirement, some support would be available. The big hoodwink–and it’s really a cheat–is that there is a CAP on the amount of earnings that can be taxed to pay into the Social Security system. Most earners don’t know this as most don’t come anywhere near the ceiling in earnings. The cap is currently about $120,000/yr, which means that earnings above that amount are NOT taxed in FICA. What kind of fairness/common good is that? There should be NO cap; instead, a proportional tax on every worker, all the way to the top earners would ensure the future solvency of Soc Sec forever. It won’t mean more tax on YOU, who probably don’t earn enough to exceed the cap and didn’t know about the cap in the first place. Rather, just tell your senator and representative–“scrap the CAP,” so high earners will pay their fair share. FICA error; there was a decrease of benefits !! I am on social security retirement and have a parttime job, why is Fica being taken out of my paycheck? Thank you for your question, Barbara. Federal laws require that everyone working in covered employment or self-employment regardless of age or eligibility for Social Security benefits must pay Social Security taxes. I would like information about deductions to be taken from my social security check for taxes but need some help. At present, I am not taking out additional money for taxes throughout the year for my income taxes. Hello Karen. We do not have access to personal information, therefore, we do not do direct messaging in this venue. Please visit our Benefits Planner: Withholding Income Tax From Your Social Security Benefits for information on this topic. Thanks! My reply would be that maybe the Government should take a heck of a lot less in taxes and payroll deductions. The fixed rates for taxes on real estate at 25% to me is criminal. The ‘mandatory’ deductions OUTSIDE OF HEALTH&DENTAL that come out of our checks add up to another 30%. SO NOW WE AT 55% OF OUR INCOME GONE, 55%!!!!! NOW COMES ‘OBAMA’ CARE-AFFORDABLE HEALTHCARE…..ANOTHER $320 A MONTH LEAVING LIKE NOTHING FOR MORTGAGE, RENT, HOUSEHOLD MAINTENANCE, SAVINGS, GROCERIES, UTILITIES, TRANSPORTATION AND THE INSURANCE FOR THAT……SINGLE PEOPLE CANNOT AFFORD TO LIVE. MYSELF AND MY KIDS HAVE BEEN TOTALLY BRUTALIZED AS WELL AS OUR HOME SINCE 1999, ENOUGH IS ENOUGH. I am 72 years old and got a green card Feb. 2018. I paid fica tax for about 26 quarters while I worked in the US during 1982~88. At present I gets SS retirement benefits for $460 monthly based on US-Korea agreement. But I am not eligible for medicare. I have foreign salary income for $18,000 this year. Can I pay fica tax on this foreign income to fulfil 40 quarters? Or should I make some income in the US for paying fica tax? Also I’d like to know if my income report affects my benefits. Your kind response would be very appreciated. How does IRS Bulletin 2014-7 apply to FICA taxes? My wife is a care provider through a state Medicaid program, for our adult son who is disabled. The agency which handles the program requires she be exempt from FICA yet she received a notice last year requiring a substantial amount be paid to Social Security after we filed our tax returns. I’ve talked with a CPA and they only wished me good luck. Any information would be appreciated. Hi, Kenny. For any income tax questions, you will need to contact the Internal Revenue Service (IRS). Their toll-free number is 1-800-829-1040. We hope this helps. Hi Ethel, sorry to hear about the difficulties you are having with Social Security. To stop your withholding, you’ll need a Form W-4V from the Internal Revenue Service (IRS). You can download the form or call the IRS toll-free at 1-800-829-3676 and ask for Form W-4V. Sign the form and return it to your local Social Security office by mail or in person. I need to start withholding taxes from Social Security Check. I do I get it done. Thank you. Hi, Robert. In order to have taxes withheld from your Social Security benefit, you must start by printing, completing and submitting an IRS Voluntary Withholding Request Form (Form W-4V). On this form, you can choose to have 7, 10, 12, or 22 percent of your monthly benefit withheld. The Form W-4V (to withhold federal taxes from your Social Security benefits) can be returned to your local Social Security office by mail or in person. See our Benefits Planner: Withholding Income Tax From Your Social Security Benefits web page for more information. We hope this helps.